Before August comes to a close, check out the latest in social media news this week. WhatsApp to Share Data with Facebook: In a reversal from their previous stance on privacy, WhatsApp has announced they will begin sharing some data with Facebook. The data to be shared includes phone numbers, device information, and operating system used. Twitter’s New Button Makes Direct Messaging from Websites Possible: Twitter continues to expand the possibilities of direct messaging with the launch of a special button that makes it possible to receive direct messages from your website. The move is intended to simplify communication between organizations and their constituents. 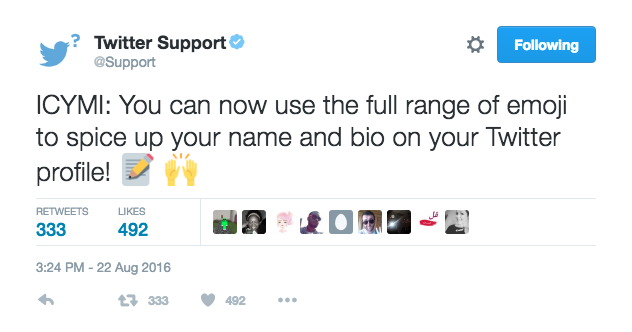 Twitter Allows Emoji in Profiles: Twitter announced through its Support account that the full range of emoji can now be deployed in users’ Twitter name and bios.